Who can resist thick, smooth, rich chocolate? No one in my house, that’s for sure! I’ve been known to make my fudge icing just to eat with a spoon. But it really isn’t the right consistency for enjoying over ice cream, so I set to work making homemade hot fudge for ice cream sundaes. I’ve tried several recipes, and combined bits of a few to get it just right and ready to share with you! This hot fudge is easy to make, smooth and rich, and stores well in the refrigerator for several weeks. Once you make this, you will not want to go back to any bottled chocolate syrup again! This summer we had a group of friends over and enjoyed a “Build Your Own Sundae Bar”. 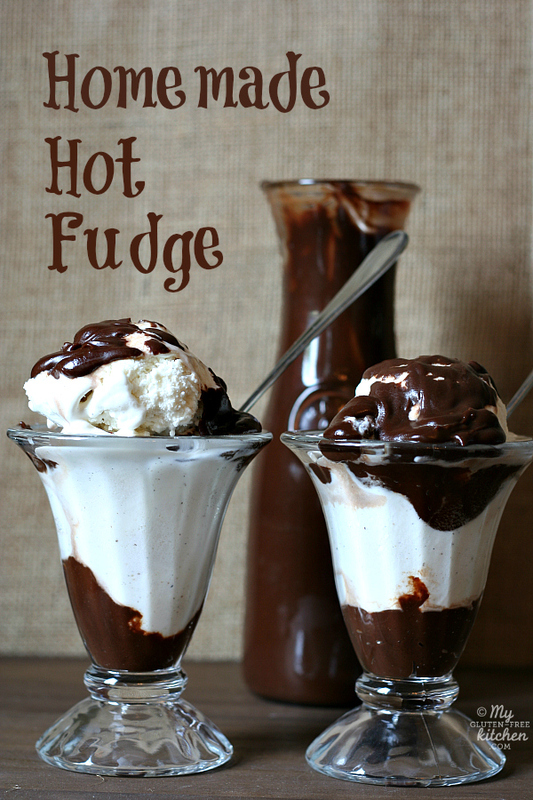 This homemade hot fudge was a huge hit! If you are looking for a way to easily serve dessert to a large group of people, especially a mixed group of gluten-free and “regular” eaters, a Sundae Bar is a fun idea. Many enjoyed Hot Fudge Brownie Sundaes, some enjoyed Banana Splits, some enjoyed Ice Cream Sundaes, and a few just loved ice cream with fresh berries. It is so easy for everyone to customize their own according to their preferences and allergies. We didn’t have anyone dairy-free at our party, but you could provide dairy-free ice cream as well. Hope this gives you some ideas so you can host your own party! Sundae parties are fun any time of the year, whether it is the middle or winter or on a hot summer night. Enjoy!! Place the butter and chocolate squares in a heavy saucepan over low heat. Cook, stirring with a whisk, until they melt. Turn off heat. Whisk in the sugar and salt. Whisk in the evaporated milk and heat over medium heat. Cook at a gentle simmer, whisking constantly, until the sauce thickens enough to coat a spatula, about 12-15 minutes. I switched to a spatula towards the end. Serve within an hour, or cover and place in refrigerator. Keep refrigerated until ready to use. To serve, reheat on top of the stove over low/medium heat or in the microwave in 20 second increments. Makes about 3 cups of hot fudge, which was plenty for 20 servings, at least. This keeps well for up to 2 weeks when kept covered and refrigerated. Caroline, I did end up eating too much of this with a spoon!! Hope you can try this soon! Thanks for your comment! Merle, I haven’t but this type of recipe would work just fine as a half batch. It should work just perfectly! Enjoy! worked great and the whole family loved it! thank you so much!! Yay! I’m so glad that you gave it a try and your family loved it! I haven’t tried piping it at all. It does get very firm in the fridge. Definitely worth a try! Otherwise, my chocolate fudge icing that I have on here is very fudgy too and it pipes like a dream (you can make it as stiff as you want to by adjusting the amount of milk you add). Definitely let me know if you try it with this recipe! I made this and it is wonderful! But we have lots more than we can eat. Do you think it would freeze well? So glad you made and enjoyed this! I’ve frozen it successfully before. When you are ready to reuse, after thawing, it will probably separate – just whisk it over low heat again to get it just right.